First Christmas Gifts for Everyone on your List! Throughout life, we all celebrate many firsts. First birthday, first Halloween, first day of school and first Christmas! The first Christmas is a special experience, and is the start of a new holiday tradition. Whether you’re celebrating a first Christmas for a baby, as a grandparent or as a new couple we have gifts and ornaments for all of the special first Christmases! A first Christmas is the start of a new holiday tradition! This is a special occasion for the precious baby celebrating their first Christmas and also for the special new parents and grandparents. 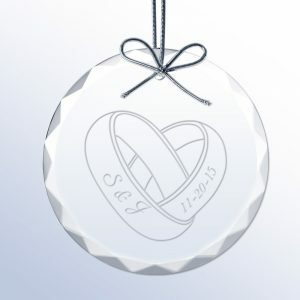 Commemorate this special Christmas with a personalized Baby’s First Christmas Ornament. Have a special Christmas themed photo or a super cute photo from the year? Put their sweet little face on a First Christmas Photo Ornament. Make it extra special by adding their name and the year of their first Christmas! 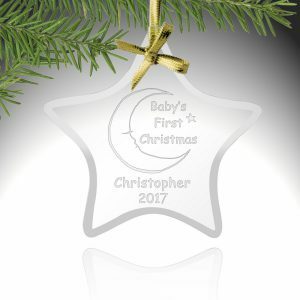 For a modern spin on the classic birth stats ornament with this classic First Christmas Crystal Ornament that is sure to impress. A baby’s first Christmas, a holiday grandma and grandpa have been not-so-patiently waiting for! 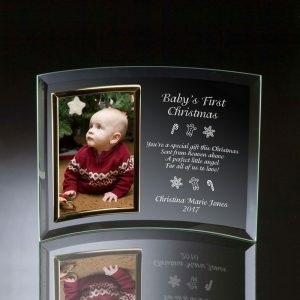 Help the new Grandparents celebrate this special Christmas with a special Baby’s Birth Record Christmas Ornament. Add a photo of the sweet little one or add their birth specs to make it a really special gift! Do you have a special photo of the new grandparents in action? 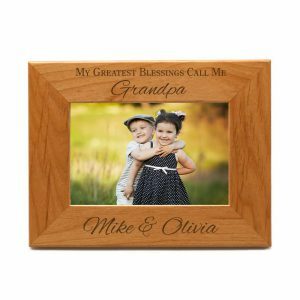 Add it to this engraved grandparents photo frame and personalize who it’s from for a heartwarming gift. Newlyweds, recently engaged or first Christmas as a couple, this Christmas will be the first of many that they will celebrate together! 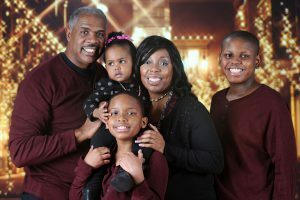 This first Christmas together will be a challenging one, meeting and merging families with double the celebrations! Commemorate this special holiday season with a personalized Christmas Ornament. Have a special or exceptionally cute photo of the love birds? 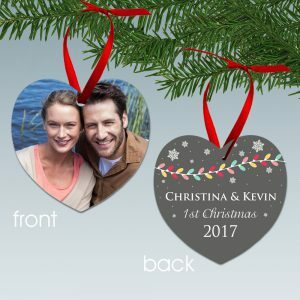 Put it on a custom Couple Photo Ornament for a really thoughtful Christmas gift. 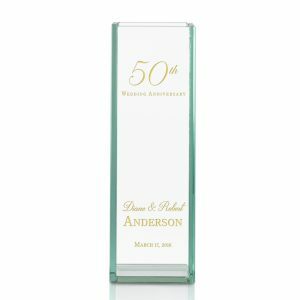 A classic engraved crystal ornament or personalized glass ornament make a great gift for the lovely couple. The holiday season is already exciting and overwhelming and moving into a new home can make it even more stressful! 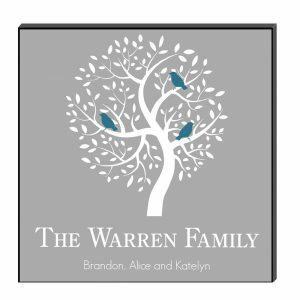 Help the new couple or family setting into their new home this holiday season with a thoughtful personalized gift! 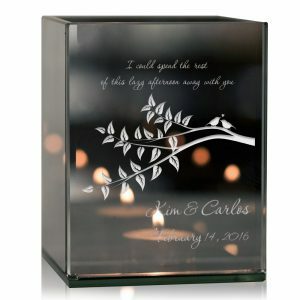 An Engraved Tea Light Candle Holder can warm up any room and a cozy set of Personalized Throw Pillows can bring it all together. 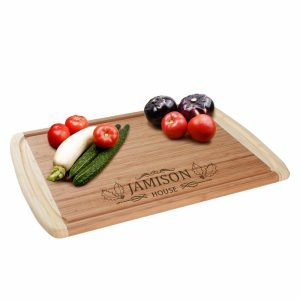 Spruce up their new home with Personalized Wall Art or an Engraved Cutting Board for their new kitchen! Help make their new house a home with a personalized First Christmas gift this holiday season! Whether you adopted or rescued your fur baby, this year is your first Christmas together! 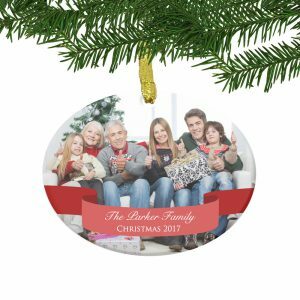 Make this a Christmas to remember with a personalized photo ornament! Add a cute photo of the two of you together or a photo of them playing with their favorite toy. 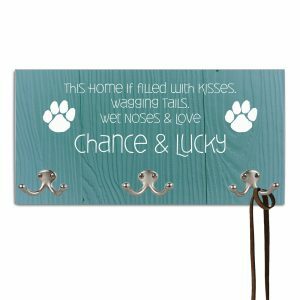 Add some personalized touches to your home with an engraved leash and collar hanger. 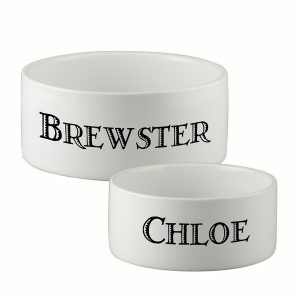 A personalized Treat Jar and matching food bowl make a great addition to your kitchen! Any of these items make a great First Christmas Gift for your beloved pet. This Christmas season, celebrate this First Christmas milestone with a personalized gift. 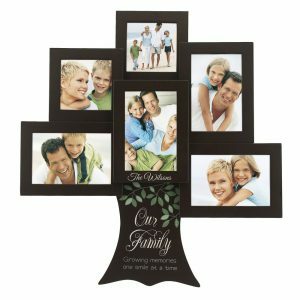 Make this First Christmas a memorable one with a thoughtful personalized gift that will be treasured and used for years to come. How do you and your family like to celebrate a First Christmas? We love hearing from you – Drop your Christmas traditions below! Anniversary gift giving is hard, especially for the special couple that is your parents. Where do you start for the couple that seems to have it all? Celebrating anniversaries is a tradition in all cultures that has been adapted for modern times. 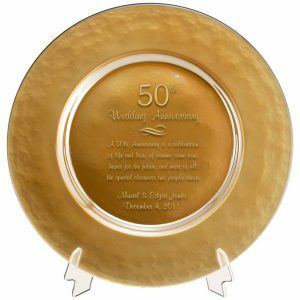 Whether they are celebrating their 10th or 60th anniversary, you can find a list of gift types ranging from traditional to modern to even flower type here in our easy to read chart. 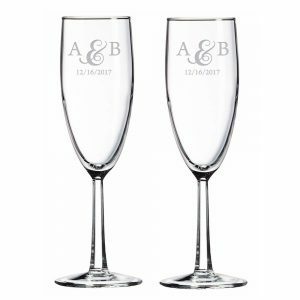 Toast to their love and future with our engraved toasting flutes or wine glass set. Throwing a surprise anniversary party for them? 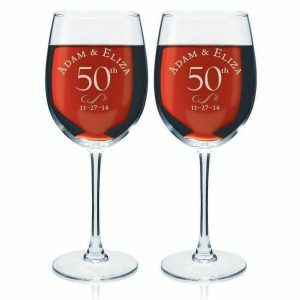 These glasses are the perfect toasting accessory and will surely make them feel special with this personalized touch. The best part is that they can be used for future anniversaries to come and look great on display. Give them something to display in their home for years to come! 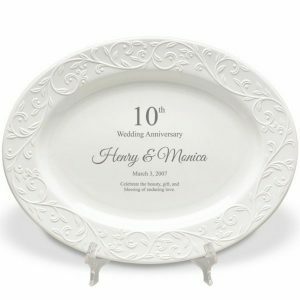 An engraved plate or personalized tray is the perfect gift to display on a mantle or china cabinet. 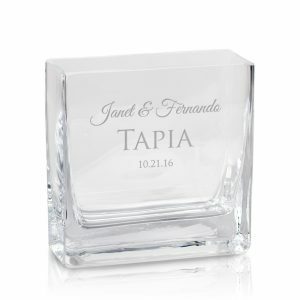 Engrave with their names, date of wedding or anniversary date and a special message. It will remind them and anyone who enters their home how special their love is. Do they have that one special photo from their wedding day or a special memory from their time spent together? 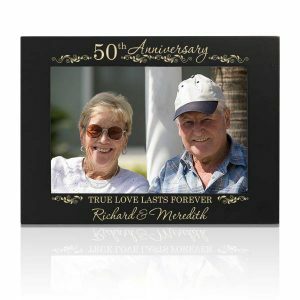 Display it in a special photo frame or canvas wrap personalized with their names, and special date. Give as a gift with the photo already displayed inside for a special surprise when they open it! Tired of gifting plain flower bouquets? Spruce it up with a personalized anniversary vase to display that anniversary bouquet. Flowers will die, but this vase will last and can be filled with fresh flowers year after year. 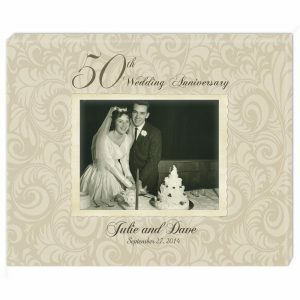 Extra points if you include their anniversary year flowers – like yellow roses for a 50th anniversary. They have always been there for you, picked you up when you fell down and kept you up through tough times. Their love serves as a great example of what a relationship should be; after all their marriage has survived when many others have not. 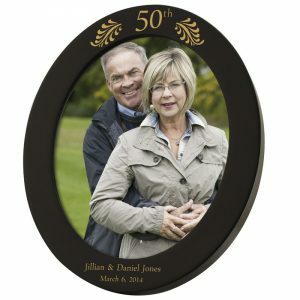 Celebrate your parent’s anniversary milestone with a thoughtful anniversary gift that will truly honor their love and make them feel special! Grandparents Day is coming up quickly and we want to celebrate some Celebrity Grandparents. They might be celebrities and constantly in the limelight, but they are humans just like our grandparents. So when it comes to being grandparent and all the spoiling duties, they are just like us! Here are our top five favorite Celebrity grandparents with their adorable grandchildren! 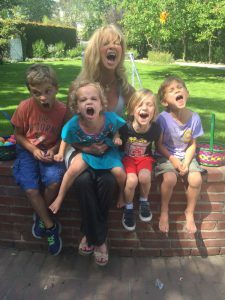 Goldie Hawn – Not the average “Glam-ma”, you can be sure that there always fun times with this firecracker! Kris Jenner – Another self proclaimed “Glam-ma”, with her large brood only a true Matriarch can balance time equally like her. 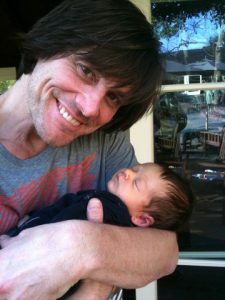 Jim Carrey – Funny man Jim Carrey, recently became a grandpa. With his silly faces and funny antics you know there is never a dull moment! 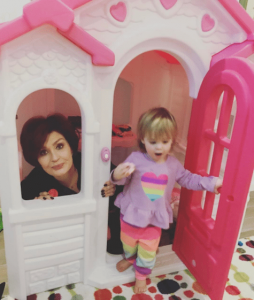 Sharon Osbourne – With Ozzy as your Grandpa and Sharon as your Grand”mum”, their grandchildren are sure to grow up with a little Rocker in them! 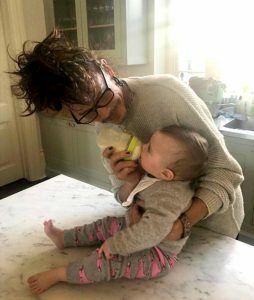 Steven Tyler – I’m sure you never though you would see the day that Aerosmith frontman would be a tender grandpa! Congratulations to these Celebrity Grandparents and Happy National Grandparents Day! Keep spoiling and loving your new additions to the family! Here at Memorable Gifts we celebrate all of the special moments in life and are glad to help you celebrate Grandparents Day! 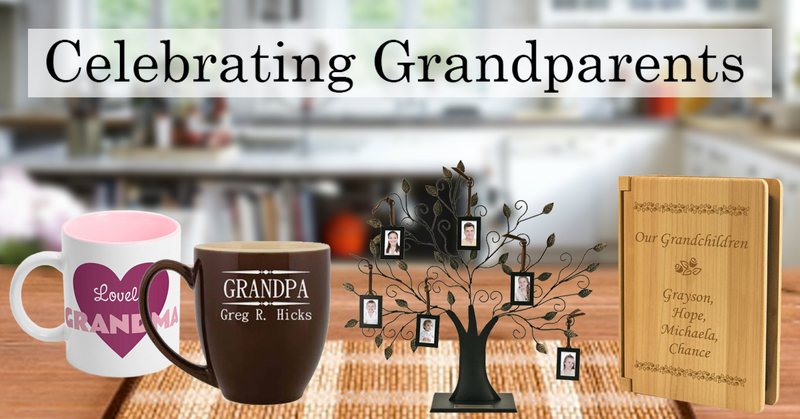 Find some unique gifts and ideas for Grandparents Day, to show them that you truly care. National Grandparents Day is coming up on September 10th and If there is one thing that grandparents are full of, its love. Always there to congratulate and celebrate your big moments in life as well as being there to pick you up and dust you off when you fall. They enjoy spoiling their grandchildren either with the newest and latest toy or with their special homemade cookies and never ever ask for anything in return besides love. This year, it’s time for us to show how much we love and appreciate them. Check out our top ideas to spoil your grandparents! 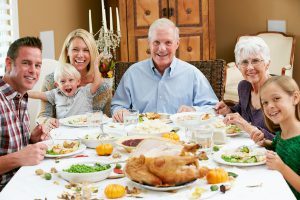 Family Brunch/Dinner – Families come together over meals and what better way to create a lasting memory than over some of your favorite dishes. Make a reservation at their favorite restaurant or get the family together to cook for surprise picnic! Interview them – Grandparents always have wisdom and knowledge not because they’re always right but because they have experience being wrong. They are full of stories and memories from the good old days that you might have never heard before. You might have a lot more in common than you thought! Gifts – It is always nice to receive a gift, especially something that was specially made for you. 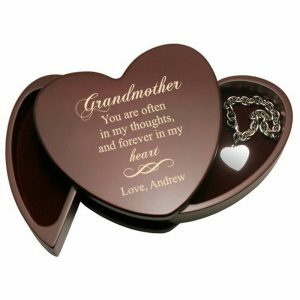 Surprise them with a personalized keepsake box where they can keep special trinkets heirlooms to pass down or an engraved family name photo frame to put their favorite photos on display. Special Surprise – Has your grandmother been begging for a trip to a spa or your grandfather eyeing that new model car? Show them that you really do pay attention and care by surprising them with that special trip they’ve been talking about. Plan an Activity – The best time is always time spent together, surprise them with a specially planned activity just for you to do together. Maybe there is a local Grandparents Day celebration in your town or city or stay at home and make a fun craft like one of these sweet ideas. National Grandparents Day is coming up on September 10,2017 so start planning now! For those of us who are lucky enough to still have our grandparents, take advantage of that special time and create memories for a lifetime. For those whose grandparents are no longer with us, take the time to commemorate their lives and everything they taught us with a special personalized memorial. However you decide to celebrate National Grandparents Day, the most important part is sharing the day with your grandparents and making new memories. Grandparents provide a loving and safe home, wisdom beyond our years, and endless warm memories of chats over hot tea and home-made snacks. They deserve to be shown just how much they’re appreciated and loved!